The Kam Powercan 60w is the latest line in KAM led par cans. The Powercan60W is unique in that it offers ultra violet output as well as a mix of red, green, blue, white and amber led’s, producing a massive colour combination. 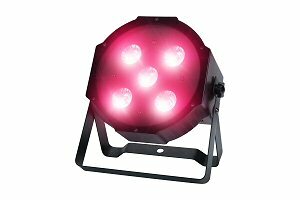 This low profile multicolour LED stage lighting features a total 60W output. Colour, sound and auto programs built in. Beam angle of 25 degrees. Use the Powercan60W on the floor or mounted on truss thanks to the “sit flat” design and included mounting bracket.